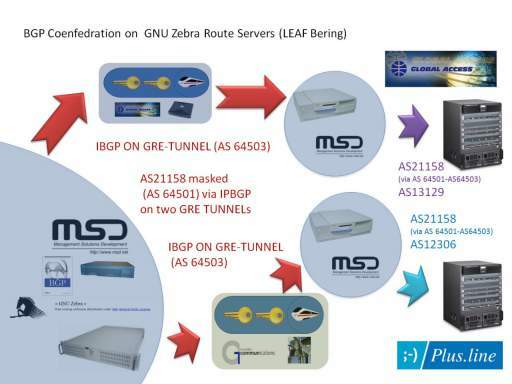 What I did in 2003 was to make the network manageable by installing route servers in the data centers of plusline AS12306 and global access (now cogent) AS13129 in Frankfurt which established gre tunnels to the router in bad homburg! 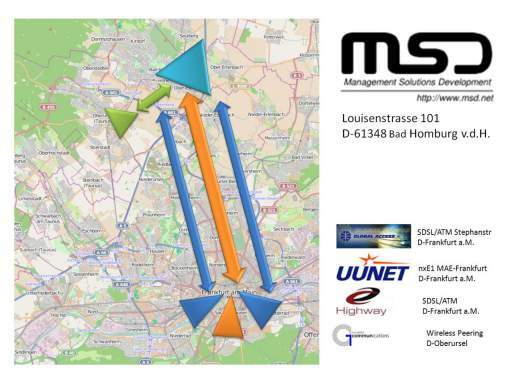 Using this setup the peerings kept maintainable even in case the location in bad homburg got lost/unaccessibale. What is new ist that instead of a ebgp peering I now use a vpn-tunnel to newly installed route servers and made a confederation of three routers, one in each remaining peer (plusline was added as a new peer, highwayone AS15477 was depeered because this was only uswed by mainly used by the MR Beteiligung/Personalberatung for their own intranet and therefore no longer needed in the new setup, uunet [now mci wolrdcom/Verizon] AS702 was depeered because they were not able to bundle n X E lines multilink mlppp, the load balancing they died was 1/3 to 2/3 on both lines) and one in the office. 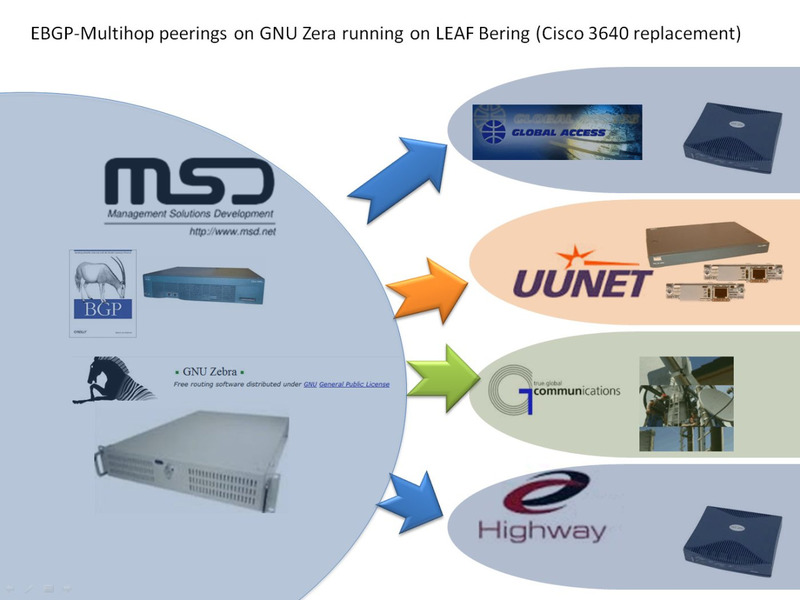 Peering by tunnels has the advanateg that it is infrastructure independent. You only have to ensure that the tunnel is routed so it only uses a physical interface. I jumped over tgc (AS15844) infrastructure to peer via a wirelss link with plsline which does not offer own wireless links. 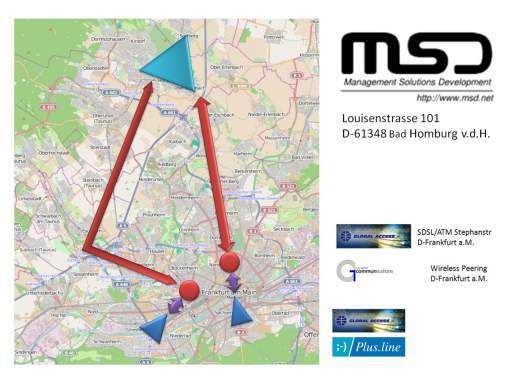 On June 30th, 2003 I left msd becaue of massive differences with the the partners, organized in MR Beteiligungsgesellschaft mbH (a holding company for MR Personalbertung GmbH) after defamatory statements of the mother of my daughter and her lawyer. At that time I held 50% of the shares and msd was incapable of action because both partners blocked each other. In 2000 Dr. Thomsen who was the tax advisor of MR betailugung and MR ersonalbertaung founded a company msd management solutions development GmbH (msd GmbH) which should take over the germany based business form msd management solutions development ltd. (msd ltd.). This step has never been completed and was only necessary because the tax-advisor tried to get additional accounting fees out of msd ltd. It was one of questions in dispute among me and the rest of the shareholders! In 2002 they tried to coerce me to accept an owner change in their shares! In the years 2001- 2003 we had massive DDOS attacks. I hink it was the try to unfriendly takeover the company by piotr dzierzaonwski and tehrfore the try to create massive traffic costs by hacker attacks for msd.net! Is the difference between a sponsoring and a supporting lir that the sponsoring lir pays the 50 Euros per year fee per /IPv4 PI-Space & AS)-Resource (AUT-NUM/INET-NUM/ROUTE/NSERVER) which is that they do all the database entries at ripe (first upstream) whilst a supporting lir only announces the space through its own as (second to nth upstream)? ?If existing members need to re-sign the ?RIPE NCC Standard Service Agreement? (for example, in case of an organisation name change), no sign-up fee will be charged.? msd management solutions development ltd., the legitime holder of the IPv4-PISpace and the AS payed in the year 2001 6000 deutschmarks to global access telecom AS13129 (now COGENT, AS174)! a supporting LIR is a (Upstream Provider with a Ripe contract (RHTEC https://www.ripe.net/membership/indices/data/de.rhtec.html) through whose AS the assignment is made (AS-Path)? RH-Tec wants to have 500 Euros a year to be a ?SPONSORING LIR?, which is in fact that they want to get paid a fee for updating the records in ripe-db as far as I understood. Msd management solutuions development ltd. payed Global Access Telecom (now Cogent) for the one-time ripe sign-up fee in 2001! WHAT ABOUT the ?one single charge of ?50.? stated here? So I cannot get a contract with ripe directly like this one? ?we calculate the number of PROVIDER IIDNEPEDNET (PI) number resources assigned TO OR BY your LIR Accounts up to 1 October 2013. A ?50 fee will be charged for each PI number resource assignment. PI number resources include Provider Independent IPv4 and IPv6 address assignments, anycast assignments and Internet Exchange Point (IXP) IPv6 assignments. Provider Independent IPv4 and IPv6 assignments made on the same day to the same customer will have one single charge of ?50. ?